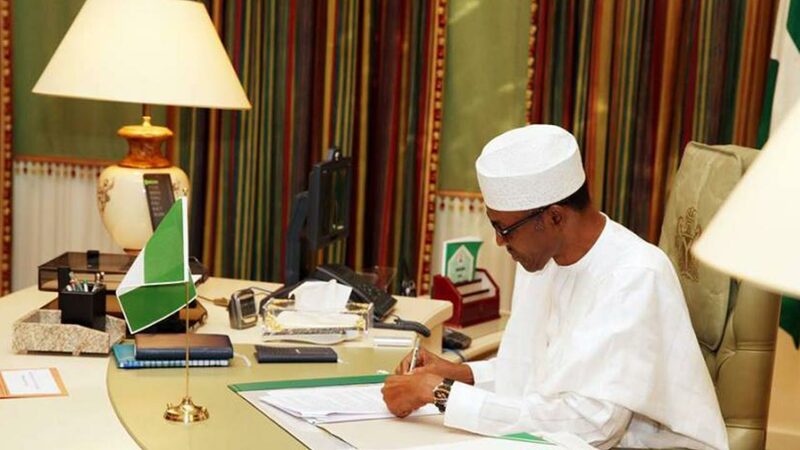 President Muhammadu Buhari on Friday signed eight bills passed by the National Assembly into law. Ita Enang, the Special Adviser to the President on National Assembly Matters, Senate, disclosed this on Friday in Abuja, while briefing State House correspondents. According to him, the bills signed into law are: Prevention of Crime Amendment Act,‎ 2016; and The National Crop Varieties and Livestock Breeds (Registration) Amendment Act‎, 2016. Others were: Telecommunications and Postal Offences Amendment Act,‎ 2016; The National Agricultural Land Development Authority Amendment Act‎ 2016; and The Produce Enforcement of Export Standards Amendment Act‎ 2016. Also signed by the President were: The Agricultural and Rural Management ‎Training Institute Amendment Act‎ 2016; Bee Import Control and Management Amendment Act‎ 2016; and Water Resources Amendment Act‎ 2016‎. Mr. Enang said that the President expressed appreciation to leadership and members of National Assembly “for the great work they did in considering the bills and the details that have gone in to consider the bills‎. He said the president also directed Ministries, Departments and Agencies (MDAs) and all government functionaries to always participate actively and make inputs when new bills were being considered. Mr. Enang commended the president for assenting the eight bills at a time, saying “this is unprecedented because this is the very first time in this administration that eight bills are forwarded to him at a go for assent. “In all my years in the National Assembly except for the 46 bills which were passed a day to the end of that administration, no such number of bills had been passed and forwarded at once ‎to the president for assent and no such number of bills had been assented to, at a record time. “I also consider it a record, that bills have been passed on various sector‎ and in giving assent to the bill, it did not lead to rancour or disputation as to what should be and what should not be.